Impress your friends with five fast facts about artist Louise Bourgeois (1911–2010), whose work is on view in NMWA’s collection galleries. The second daughter of Joséphine and Louis Bourgeois, Louise was named after her father. Though Bourgeois did have a younger brother, she ensured the family’s legacy by giving her three sons her last name rather than that of her husband, Robert Goldwater. Bourgeois initially studied mathematics, and it wasn’t until after her mother’s death in 1932 that she decided to pursue art in earnest. Although spiders provoke fear for some people, Bourgeois recognized their positive qualities and saw their protectiveness reflected in her mother, who was also a weaver. 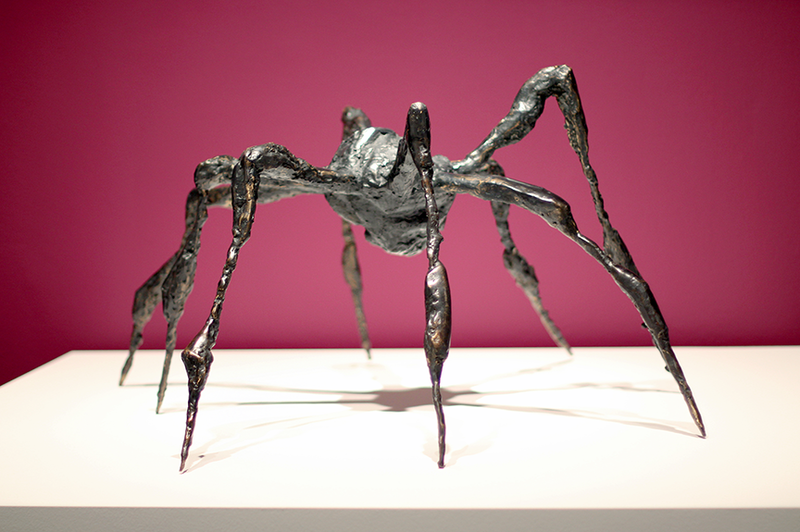 Bourgeois rendered arachnids throughout her long career, including seven sculptures titled Maman (1999) which stand over 30 feet high. These eight-legged giants grace collections around the world. Another theme Bourgeois returned to throughout her career was the relationship of a woman to her home. She combined human and architectural forms in the works titled Femme Maison, which translates to “woman house” or “housewife.” These paintings and sculptures appear in her oeuvre from 1945 to 2004. Bourgeois is a subject—as well as an artist—in NMWA’s collection. In SoHo Women Artists (1978), May Stevens represented members of her community based on photographs, including Bourgeois in one of her wearable sculptures. —Ashley Harris is the associate educator at the National Museum of Women in the Arts.